STOP HS2 | Forget EVEL, HS2 is supposedly a ‘UK-Wide’ project. Following the vote yesterday in Westminster for ‘English Vote for English Laws’, there has been a lot of talk about HS2. Scots, Welsh and Northern Irish have been saying that if their MPs will not get to vote on HS2, which is to be built solely in England, then they shouldn’t have to pay for it. Unfortunately this is not the case, as Westminster has defined HS2 as a ‘UK-Wide’ project, insisting that the benefits will be felt throughout the land. So while MPs from outside of England will get to vote on HS2, taxes from their constituents will go towards paying for it, and because it supposedly benefits the whole UK, nowhere is set to get compensation via the Barnett formula. 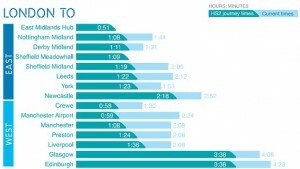 “This project is estimated to cost £50-80bn, improving rail links between London, Birmingham, Manchester and Leeds. The Westminster Government has branded this an UK-wide scheme but the last time I looked, all those cities were in England. 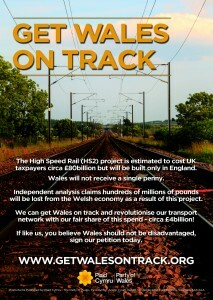 “Welsh taxpayers should not be expected to foot the bill for this vanity project unless our nation is fairly compensated. Based on Wales being home to 5% of the UK population, we should receive £2-4bn for our fair share. “This is a staggering sum of money that could revolutionise our transport system and deliver much needed projects such as the electrification of the North Wales Main Line, the Valleys Lines, a South Wales Metro, and countless road projects up and down Wales. Taking the official cost of 50.1bn HS2, if HS2 were determined as ‘England-Only’, payouts for Wales and Northern Ireland would increase the cost of the project by £4.6bn. Including Scotland would cost £5bn, meaning a total Barnet consequential of £9.65bn*, this would put the current overall official cost at £59.75bn. 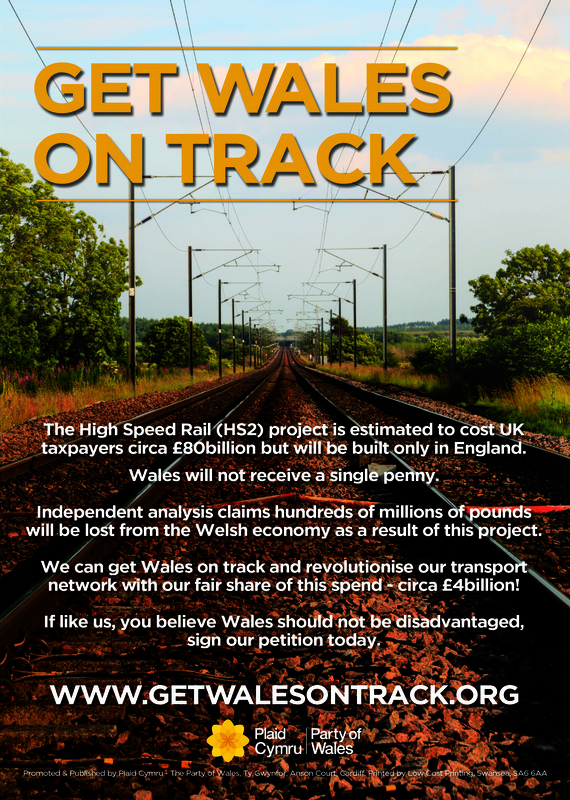 Plaid Cymru had been using the £80bn estimate from the Institute of Economic Affairs, which given the fact the official costs of HS2 are still quoted on 2011 prices is not an unreasonable thing to do (A leaked Treasury estimate put the bill at £73bn in 2013). If full Barnett Consequentials were added to the £80bn figure*, it would put the overall cost of HS2 at £95.41bn (£4.6bn for Wales, £2.8bn for Northern Ireland, and £8bn for Scotland). Whilst the case for saying Wales would benefit from HS2 is weak, in Northern Ireland it is non-existent, a sentiment backed up by a KPMG report which was commissioned to make up economic benefits of HS2, which failed to recognise Northern Ireland is part of the UK. However, with regard to Scotland, the plan has always been that the country would ‘benefit’ from HS2. The reason is that although HS2 is not to be built in Scotland, and a leaked report claimed there was ‘no business case’ for extending the line North of the border, HS2 is meant to reduce journey times from London to Glasgow and Edinburgh. Trains would travel on HS2 from London to Crewe, then join the West Coast Mainline. This means that as far as Westminster is concerned, Scotland benefits from HS2, meaning it isn’t an ‘England-Only’ project, the Scots have to pay for it and won’t get any Barnett money back. Of course, this ignores the infamous KPMG report which claimed that even with getting that reduced journey time, the Glasgow economy could lose up to £77m per year, as a result of those wonderful ‘benefits’. The bottom line is that Westminster saying that HS2 is a ‘UK-Wide’ project has always been to make sure there are no Barnett payouts. Sticking with this will mean that Scottish, Welsh and Northern Irish MPs will get to vote on HS2, but as it will mean those countries pay toward it, don’t hold your breath on them voting for it.